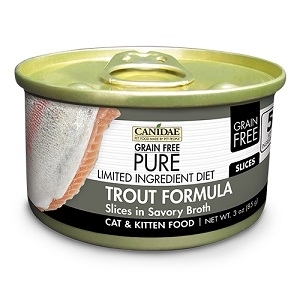 CANIDAE® Grain Free PURE® Limited Ingredient Diet: Trout Recipe Canned Cat Food, 3 oz. Made without grains, potatoes, or carrageenan, CANIDAE® Grain Free PURE® Limited Ingredient Diet: Trout Recipe has 5 key ingredients for great feline nutrition with trout as the first ingredient. Cats will love these slices in a savory broth. 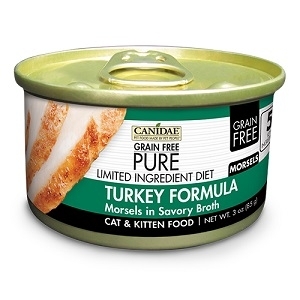 CANIDAE® Grain Free PURE® Limited Ingredient Diet: Turkey Recipe Canned Cat Food, 3 oz. Made without grains, potatoes, or carrageenan, CANIDAE® Grain Free PURE® Limited Ingredient Diet: Turkey Recipe has 5 key ingredients for great feline nutrition with turkey as the first ingredient. Cats will love these morsels in a savory broth. CANIDAE® Grain Free PURE® Limited Ingredient Diet: Salmon Recipe Canned Cat Food, 3 oz. 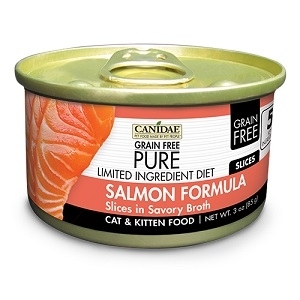 Made without grains, potatoes, or carrageenan, CANIDAE® Grain Free PURE® Limited Ingredient Diet: Salmon Recipe has 5 key ingredients for great feline nutrition with salmon as the first ingredient. Cats will love these slices in a savory broth. 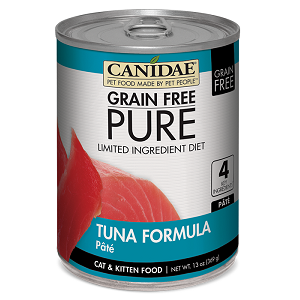 CANIDAE® Grain Free PURE® Limited Ingredient Diet: Tuna Recipe Canned Cat Food, 13 oz. Made without grains, potatoes, or carrageenan, CANIDAE® Grain Free PURE® Limited Ingredient Diet: Tuna Recipe has 4 key ingredients for great feline nutrition with tuna as the first ingredient. Cats will love this pâté texture. CANIDAE® Grain Free PURE® Limited Ingredient Diet: Tuna Recipe Canned Cat Food, 3 oz. 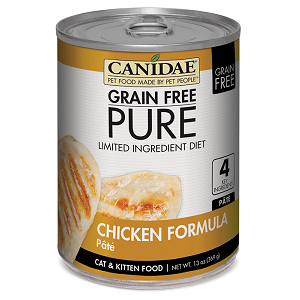 CANIDAE® Grain Free PURE® Limited Ingredient Diet: Chicken Recipe Canned Cat Food, 13 oz. 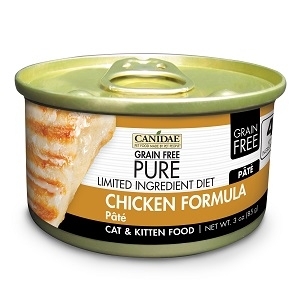 Made without grains, potatoes, or carrageenan, CANIDAE® Grain Free PURE® Limited Ingredient Diet: Chicken Recipe has 4 key ingredients for great feline nutrition with chicken as the first ingredient. 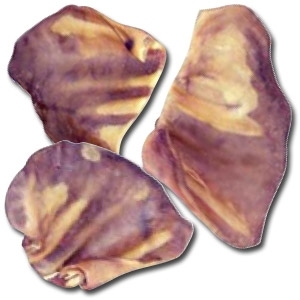 Cats will love this pâté texture. CANIDAE® Grain Free PURE® Limited Ingredient Diet: Chicken Recipe Canned Cat Food, 3 oz. 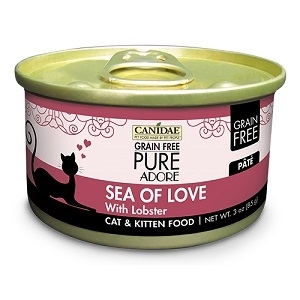 CANIDAE® Grain Free PURE® Adore: Sea of Love Recipe Canned Cat Food, 3 oz. CANIDAE® Grain Free PURE® Adore: Sea of Love is a decadent meal inspired by gourmet chefs, featuring lobster as an exotic protein. Made without grains, potatoes, or carrageenan, your pampered feline will adore this pâté style recipe. CANIDAE® Grain Free PURE® Adore: Decadent Delight Recipe Canned Cat Food, 3 oz. 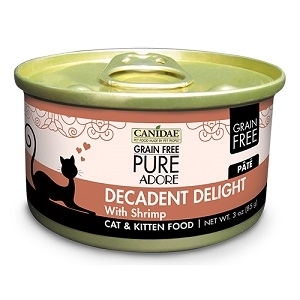 CANIDAE® Grain Free PURE® Adore: Decadent Delight is a decadent meal inspired by gourmet chefs, featuring shrimp as an exotic protein. Made without grains, potatoes, or carrageenan, your pampered feline will adore this pâté style recipe. 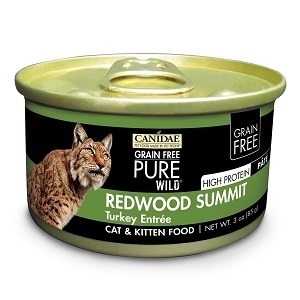 CANIDAE® Grain Free PURE WILD®: Redwood Summit Recipe Canned Cat Food, 3 oz. 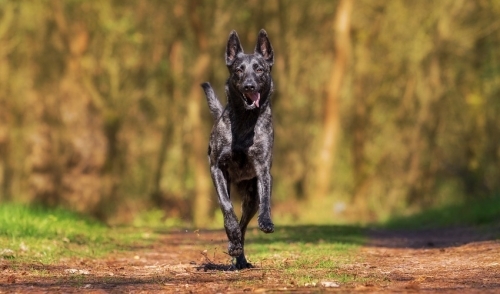 CANIDAE® Grain Free PURE WILD® is made without grains, potatoes, or carrageenan and with premium ingredients for quality nutrition. With turkey first for high animal protein, your cat will go wild for this pâté style texture. 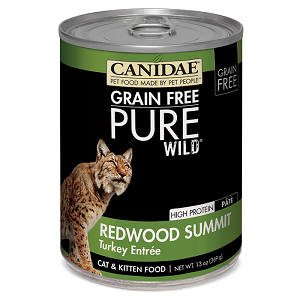 CANIDAE® Grain Free PURE WILD®: Redwood Summit Recipe Canned Cat Food, 13 oz. CANIDAE® Grain Free PURE WILD®: Rushing River Recipe Canned Cat Food, 3 oz. 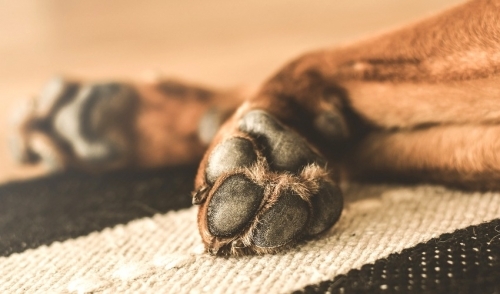 CANIDAE® Grain Free PURE WILD® is made without grains, potatoes, or carrageenan and with premium ingredients for quality nutrition. With salmon first for high animal protein, your cat will go wild for this pâté style texture. CANIDAE® Grain Free PURE WILD®: Rushing River Recipe Canned Cat Food, 13 oz.